Proliferations opening tonight in SF! Please stop by if you get the chance, I’ll have a new robot installation in action! Artist Reception Friday March 12th, 7:30 to 9:30pm. OFF Space, an artist-run curatorial collective, brings contemporary works uptown to swanky wealth management offices in the financial district and into the ‘hood, behind the roll up door of a Public Storage unit in Bay View Hunter’s Point with Proliferations. True to its nomadic nature OFF Space mounts exhibitions in a variety of locations.Proliferations, a two-site show premiered at the wealth management offices of Rhodes & Fletcher on Dec. 3rd and runs through March 4. In contrast, Part 2 will be presented on the sly to escorted groups in a Public Storage unit on the evening of March 12 and then by appointment through March 27.
tool for reappraisal and change. Artists Alicia Escott, Eric Gangsei and Michael Ryan take on material production, waste and reuse along with the consequences of these processes sculpturally and pictorially. Justin Hoover uses the history of performance art, a practice best known for its history as a form of social rebellion, as his material to create a performative work that acts to illustrate the exhibition theme and comment on the promises of globalization. Peter Foucault sets up mechanical systems through which viewers and robots interact to produce densely layered graphite drawings of repetitive and random marks. Sculptor and video artist David Stein presents a unique look at media and culture with his totem-pole video exploration of popular print media. Alexis Arnold’s sculptural abstraction on Baobab powder production presents the realities of a global economy and the exploitation and destruction left behind as the result of satisfying Western consumption, while Michael Kerbow goes right to the core and reconstructs a map of the world through the grotesque lens of excess. Speaking to this era of both limitless and very limited possibilities, the artists in this exhibition reflect upon and inspire strategies for understanding our present realities. Whether creating systems that measure and encapsulate contested territories, reexamining portals of material accumulation, or actualizing the collisions of history, this exhibition brings together artists who both critically and formally address the sites and theme of Proliferations. To learn more about OFF Space visit off-space.org. 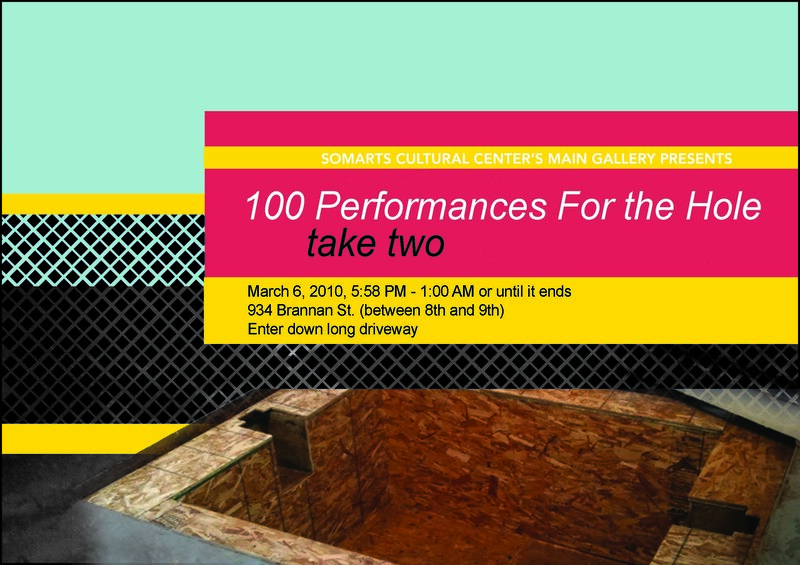 100 Performances for the Hole – Take Two breathes fresh life into a formerly disused part of the SOMArts Main Gallery, namely what remains of the mechanics pit from the building’s former life as the Union Machine Company. Through a simple hole and an open call for ephemeral performance artwork, 100 Performances highlighting the contemporary timescape of today and invigorates a wide swath of the performance art community, one that is vibrant, innovative, playful, and elusive. This tour-de-force of the ephemeral is juried by Kevin B. Chen, Peter Foucault, Justin Hoover, Jackie Im, Lex Leifheit, and Lucy Kalyani Lin. We will have plenty of food and drink so stay for the night. The event is free, but a sliding scale entrance donation (between $2 and $20) is encouraged. Donations will help support the Commons Fund for curatorial residencies at SOMArts. Enter down long driveway. Street parking available and flat rate parking is accessible at Brannan & 8th St . SOMArts is within two blocks of the Muni lines number 12, 19, 27 and 47.